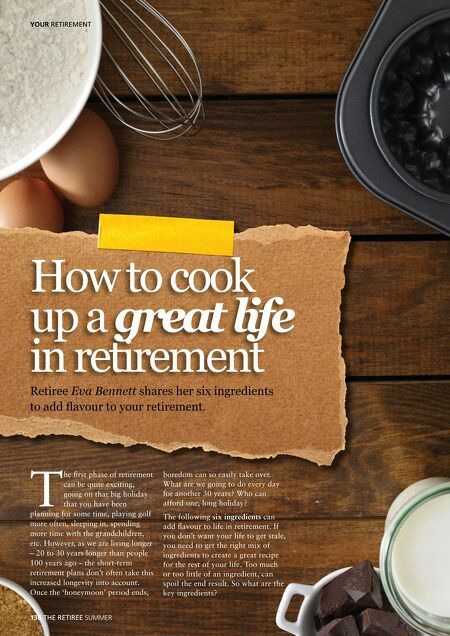 YOUR RETIREMENT How to cook up a great life in retirement Retiree Eva Bennett shares her six ingredients to add fl avour to your retirement. planning for some time, playing golf more often, sleeping in, spending more time with the grandchildren, etc. However, as we are living longer – 20 to 30 years longer than people 100 years ago – the short-term retirement plans don't often take this increased longevity into account. Once the 'honeymoon' period ends, T 136 THE RETIREE SUMMER he fi rst phase of retirement can be quite exciting, going on that big holiday that you have been boredom can so easily take over. What are we going to do every day for another 30 years? Who can afford one, long holiday? 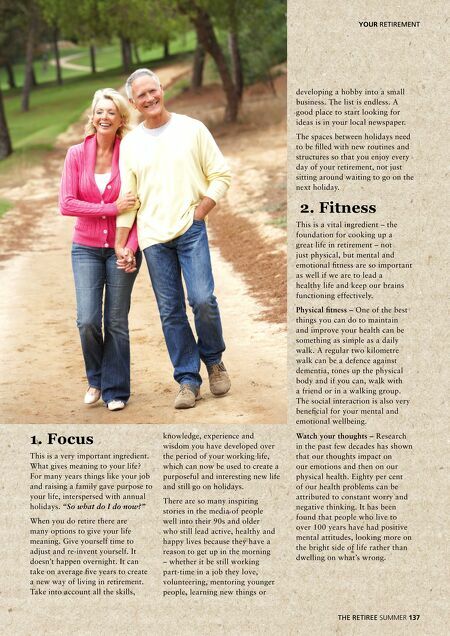 The following six ingredients can add fl avour to life in retirement. If you don't want your life to get stale, you need to get the right mix of ingredients to create a great recipe for the rest of your life. Too much or too little of an ingredient, can spoil the end result. So what are the key ingredients?